The sound of nearly two hundred demonstrators could be heard throughout the Upper West Side last night declaring “Black Lives Matter” in Columbus Circle. “People tell us we’re wasting our time, but civil rights wouldn’t have been passed if the people then didn’t do what they did,” said Priscilla Ortiz, 38, from Jersey City. 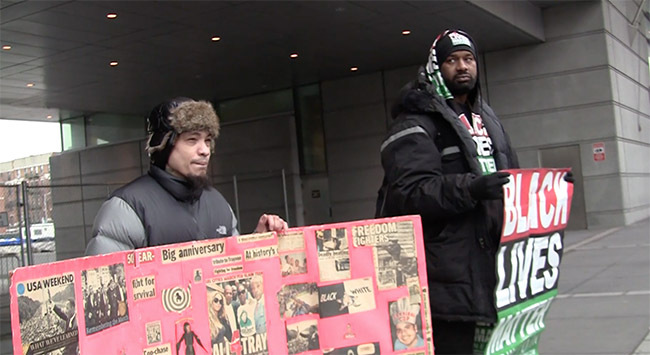 Hoods4Justice, a community organization in New York fighting for black and brown liberation nationwide, organized Saturday’s march. The march began at Columbus Circle, continued through Central Park, down Madison Avenue, and ended at Rockefeller Plaza with an uplifting call and response led by one of the organizers. Some demonstrators wore t-shirts with “Black Lives Matter” proudly inscribed on their chests, and others wore Kaepernick jerseys in support of the NFL player’s recent stance behind the movement. The demonstration was called “an emergency rally and march” on the Facebook event in response to recent cases of police brutality. Tensions rose nationwide after the fatal shooting of Terence Crutcher, 40, of Tulsa Oklahoma last week and Keith Lamont Scott, 43, of Charlotte North Carolina this past week, and protests erupted nationwide. 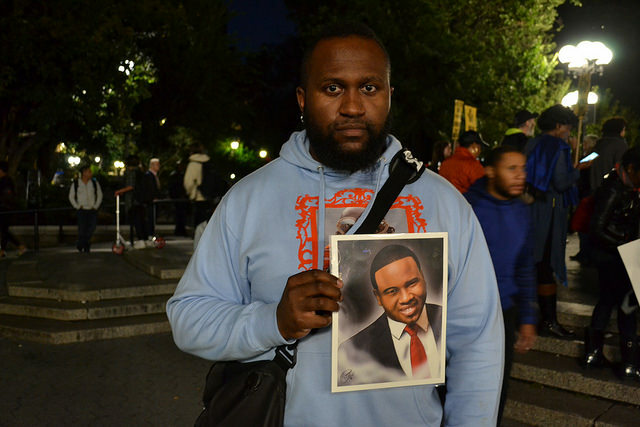 But beyond these two recent killings, Saturday’s demonstration in New York was part of the larger mission to effectively end police brutality. A mission that carries many more names on its list of victims – Trayvon Martin, Freddie Gray, Kendra James, Alton Sterling and others. “Listen, I don’t believe all cops are bad, but I think it’s come to a point where they’ve become a cult, and that’s not okay,” said Ortiz. The New York Police Department was in full attendance. Blue uniforms lined the streets with barricades, vans, motorcycles and a helicopter patrolled overhead. The whirring of the propellers turned several eyes to the sky and provided an added layer of unease. Ortiz has been an active demonstrator for most of her adult life. Growing up in Texas, she experienced first hand the tension between police and minorities. “I was visiting Texas in 2012 and my car had New Jersey license plates. The cop pulled me over and said my backlights were out. My backlights weren’t out. 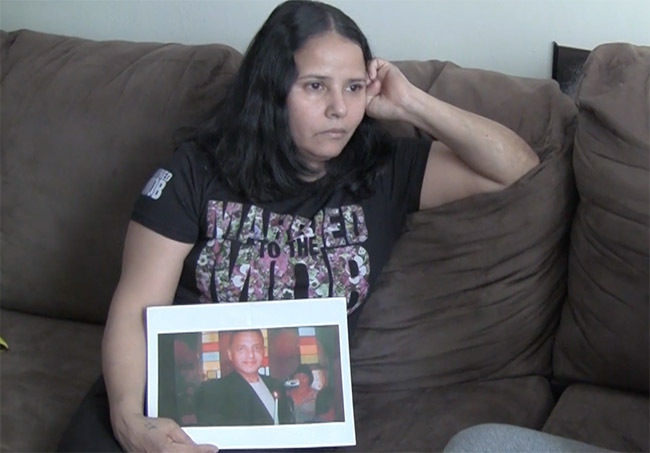 You’re a minority driving down the street and they find a reason to pull you over,” said Ortiz. Ortiz heard about the event on Facebook and came with her 3-year old daughter Elizabeth, who was wearing a button that read, “We need a Political Party of the 99%”. 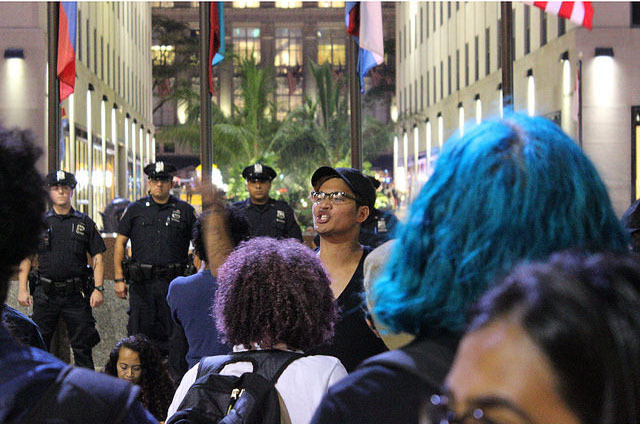 After the one mile march, leading member of Hoods4Justice spoke to the crowd of demonstrators in Rockefeller Plaza on Saturday night as NYPD officers stood along the perimeter. Photo by Brandon Gomez. As the crowd formed, Ortiz grabbed her megaphone, commanded the crowd’s attention and led them in several chants. Also chanting in the crowd was Mimi McDermott, 74, of the Upper West Side. McDermott was a part of many rallies in the sixties and has continued to participate throughout the years. She supported several movements including the anti-war movement, the civil rights movement, and now, Black Lives Matter. “We thought we made progress in the sixties, and I guess we did, but it’s back and even more vehement now because we know the problems and here we are again,” said McDermott. McDermott reflected on her years of rallies and demonstrations. McDermott was uncertain of the lasting impact of the evening’s rally, but shared hope for an increase in the number of marchers. 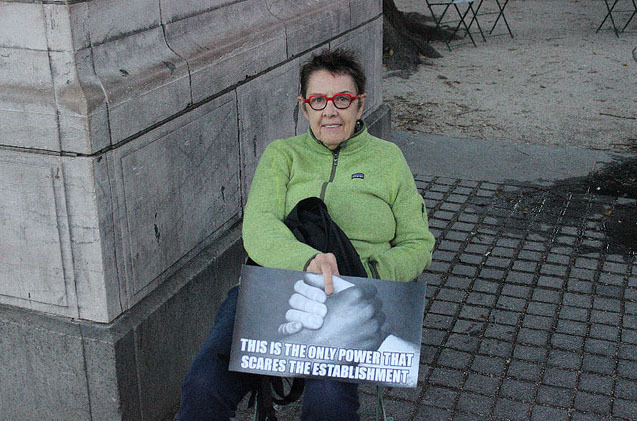 Mimi McDermott, 74, of the Upper West Side sat and waited for the rally to begin. She has been attending rallies and protests since the 1960s. Photo by Brandon Gomez. As the rally began, more and more people passing by could be seen joining. The occasional scoff or “Blue Lives Matter” could be heard. But they were overpowered by the number of people stopped with a raised fist or a raised iPhone, which recorded a quick clip of the event. Noreen Abouelnaga, 16, of Astoria Queens was out taking pictures at Plaza Hotel and eating lunch in Central Park when she and a friend stumbled onto the rally. 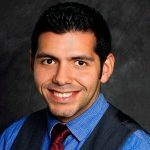 “In the media there’s a lot of anti-black especially when it comes to white people and police brutality, and so I thought it was okay to stop and say that black lives matter,” said Abouelnaga. Abouelnaga comes from a Muslim household with immigrant parents. She talked about the constant struggle she has with them to understand race relations in the United States. As a muslim, she said she can identify with the movement. “I think if I stand here supporting black lives and Snapchat it or put it up on Instagram, and my friends see it, I think it gets the message to people my age that it’s not ok,” said Abouelnaga.